ProMiTech Review 2019: Is ProMiTech a Good Hosting? ProMiTech Technologies is a U.S.-based hosting provider. They sell a small range of hosting plans as well as website design and development services. ProMiTech Technologies is a small U.S. company with fewer than ten employees and only a couple of hundred customers. However, they’ve been in business since 1999 and have a relatively large social media following plus positive customer reviews on third-party websites. They provide their website and support in English. 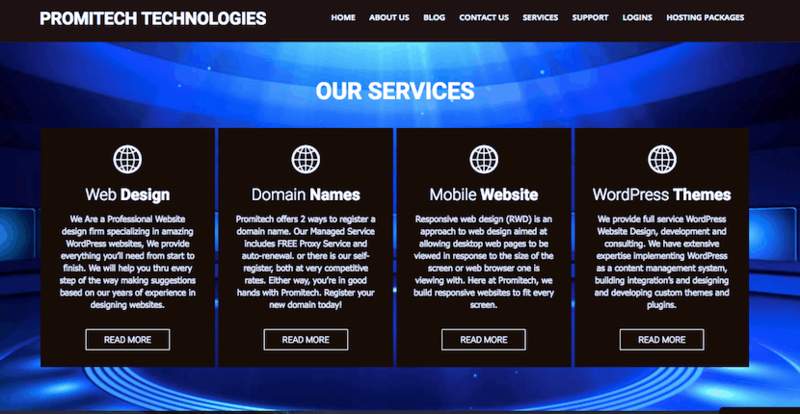 ProMiTech Technologies offers a suite of website solutions, from WordPress development to domain registration and shared hosting. ProMiTech’s shared hosting plans offer four resource levels – Personal, Basic, Business, and Business Pro – which come with limited resource quotas of 200MB/500MB/800MB/1500MB storage, 2000MB/4000MB/7000MB/15,000MB bandwidth, and one/two/five/unlimited domains respectively. All plans come with unlimited email and auto-responders, and all but the basic plan come with unlimited FTP accounts. In terms of features, the plans are a little sparse. All plans come with a one-click CMS installer and CGI support. At the checkout, you can purchase either the Lite, Starter, Pro or Business version of the Weebly website builder which comes out-of-the-box with a drag-and-drop tool plus readymade responsive templates. As well as the website builder, additional add-ons in the checkout flow are SiteLock website security, SpamExperts email security, Yoast SEO plugin, and dedicated IP addresses. Depending on your perspective, these are either nice ways to customize the base packages or are unnecessary penny-pinching on the part of the vendor. They installed new servers in 2014, and whilst they don’t provide an uptime service level agreement, this is quite common for a business of this size. All plans come with the popular and easy-to-use cPanel Accelerated control panel, and it’s nice to know that the company founder is clearly a specialist in WordPress design and development, so you know you’re in safe hands in the event of a technical issue. Unfortunately, the prices are quite high, especially when you consider that the plans are quite limited in resource quotas and features. Be sure to consider that as well as the list of optional add-ons noted previously, domain registration is also an added cost. You can buy their hosting with one, three, six, and twelve-month terms lengths. It’s nice that you can choose either a low-risk monthly plan or get a discount for purchasing longer terms upfront. However, all fees are non-refundable. If you need support, this company has a small knowledge base, a support ticket center, an email address, and a telephone number. And technical support is available 24/7, which is great. They also have quite a few support pages behind a login screen. ProMiTech is a small business headed by an industry expert. If you’re looking for an alternative to the big players in the U.S. hosting scene, this could be a good fit for you. 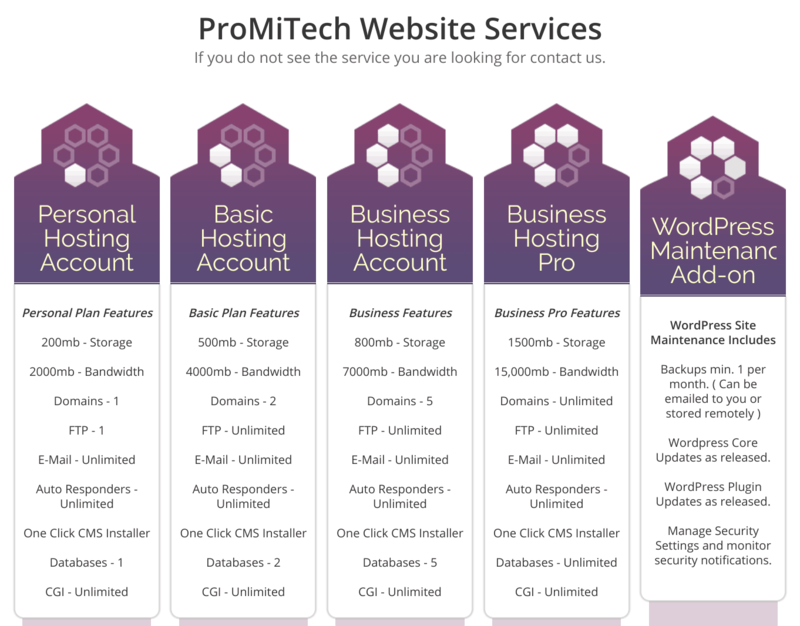 Wondering how ProMiTech stacks up against other Web Hosting companies? Enter any other Web Hosting company and we will give you a side-by-side comparison.